In today’s world of corporate espionage, your company probably doesn’t want you tossing printed data in the trash directly. After government agencies started using electric shredders in the late 50s, the practice quickly became widespread. However, those old-timey paper shredders were a real pain on the ears. So today, I’m going to dig through the ones on offer to bring you the best quiet paper shredders for home and office use. At this point, you may be wondering if you really need a paper shredder at home. And, the truth is, you don’t. Personally, though, I recommend having one on hand so that you can dispose of sensitive information properly. If you’re not someone who makes it a point to neatly organize and keep every bill you ever get, you’re probably just tossing them out. But that’s really not something you should be doing. Instead, you can scan and save your bills and other important documents online or on an external drive and shred the rest. 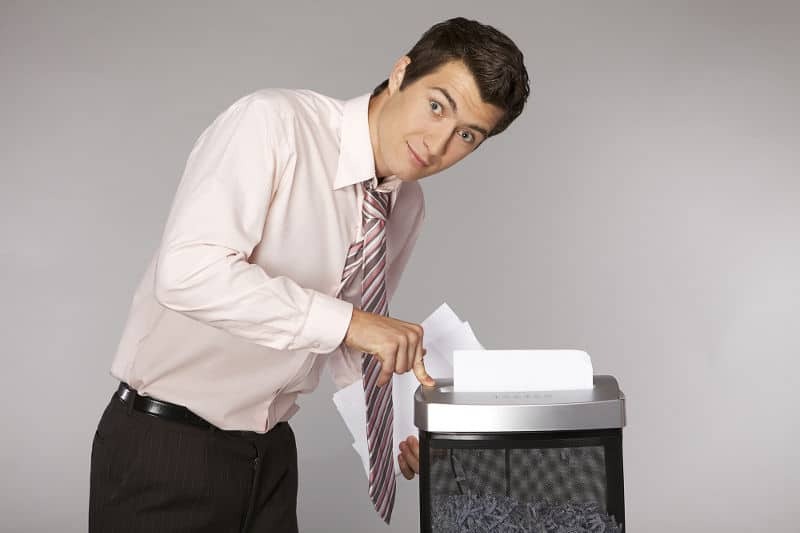 In this article, I’m going to give you several suggestions of paper shredders you can use. And, as always, I’ll preface that by explaining some of the features you need to keep an eye on when you go shopping. But before I get to all of that, let’s talk about whether getting a paper shredder is a good idea at all. As I have already mentioned, you may have some questions about why you’d even need a paper shredder. Well, I’m here to answer them to the best of my ability. During the past several decades, we’ve become paranoid about spying and data theft. Thus, paper shredders could make it more difficult for companies to commit corporate espionage and for hopeful identity thieves to gain access to our personal information. However, that’s not to say that the system is without flaws. For one, if you don’t dispose of the shredded waste properly, someone just might be determined enough to piece it back together. So you’re going to want to make sure that you get a shredder that can cut the paper into tiny particles. Many commercial shredders also only take one sheet of paper at a time, slowing down the whole process. But nowadays, even small machines can handle more than that. Before manufacturers realized that we needed high-capacity machines rather than these one-sheet-wonders, many businesses outsourced their document shredding. Clearly, if you’re trying to protect your privacy, and more importantly, your clients’ privacy, this may seem counterintuitive. In any case, if you’re self-employed or run a small business, it would definitely be more cost-effective to buy a shredder. It would also save time you would have otherwise spent disposing of the documents yourself. Many companies in the past relied on incinerators to do that, which is obviously much less eco-friendly than simply shredding the paper. Furthermore, if your company is really small, the cost of a machine may outweigh its usefulness. Ultimately, you’ll have to choose whether or not you need a paper shredder yourself. If you’re producing a lot of paper waste that needs to be secured before it heads to recycling, you should absolutely get a paper shredder. Before I started looking for quiet paper shredders, I had to really dig deep and get familiar with these things. So let’s start with some paper shredder basics. The general features include cutting styles and the strength and capacity of a shredder. However, I’ll also tell you why size matters in this case and how you can find the best machine for your needs. But first, let’s talk about why some units are louder than others. Obviously, anything that has any kind of motor inside it is going to produce some level of noise. Actually, I don’t think any paper shredding method is completely noiseless. However, many of the quiet shredders on my list actually have features that help them run more smoothly. They often have anti-vibration mats around the motors and are actually built with some sort of internal insulation. Old or industrial shredders are often built for durability and performance, which means that they’re often made of metal. As you know, metal is usually not the best at handling vibration, so these end up producing even more noise. Thus, you may notice an absence of this material in the products I’ve chosen to showcase. Typically, quiet shredders promise to make no more than 80 decibels of noise, though some of them can do even better than that. They also often have special frictionless blades, though some models may require occasional oiling. If the paper shredder you end up getting needs to be oiled from time to time, I suggest keeping the oil on hand. Sometimes, shredders start acting up and making noise because they just haven’t been oiled in a while. In my opinion, that’s pretty much the best case scenario. If all you need to stop the screeching is oil, the problem is easy to solve. Strip-cut shredders will cut your documents straight across into ribbons. Because the blades necessary to do that are fairly straightforward, this type of shredder is the quietest. Still, I’d dare to say that ribbons of paper are the easiest to put back together. Cross-cut shredders have more complicated blades, which may cause more noise. However, they would convert your private documents into paper confetti that would be much harder to put back together again. Micro or particle-cut shredders are perhaps the most secure option, as they produce the most jumbled results. The size of the particles a shredder produces is actually rated using a standardized system. The rating system goes from P1 to P7, but it’s not as simple as P1 shredders producing 0.47-inch particles and P7 producing 0.03-inch particles. Actually, P1, P2, and P3-rated machines produce 0.47, 0.23, and 0.07-inch particles, respectively. The next three security ratings, P4, P5, and P6, can make 0.23, 0.07, and 0.03-inch particles. However, they also have to be able to compress the remains into 0.24, 0.04, and 0.01 square inches. For security reasons, the U.S. government only uses shredders with a P7 rating to deal with classified documents. You probably won’t need these powerhouse machines, as they produce 0.03-inch particles compacted to 0.001 square inches. Furthermore, aside from paper, many units can also handle shredding CDs and even credit cards. Essentially, the more complicated the blades are, the more noise they’re going to make. I’ll make sure to emphasize the type and the decibel level in my reviews if the information is provided in the product descriptions. Until recently, many shredders you could have used at home would have only been able to take one sheet of paper at a time. Fortunately, most of the units in my reviews can handle a bigger workload than that. In fact, I’d say that the average number of paper you can put in most units is about 15 sheets. What’s more, many of these machines can have that number of sheets in tatters within about 10 seconds. There are exceptions to every rule, of course, but that’s what you can expect out of most high-quality shredders. Even though I’ve already said that size matters when you’re picking the perfect shredder for your home or office, I’ve yet to explain why. You see, one of the greatest advantages of having a shredder on hand versus tossing your paper directly in the trash is that you’re saving space. After all, a stack of paper takes up more space than a bucket full of tatters. Well, that’s where the size of the shredder comes into play. More specifically, the taller your shredder is, the bigger its storage space is. That means that you wouldn’t have to empty the container too frequently. So, in this case, I would recommend getting a taller unit if you can swing it. Believe it or not, shredder manufacturers don’t want their customers to lose any digits. In the interest of keeping the maximum number of fingers attached to your hands, most shredders have insertion slots that are too narrow for hands to go into. Still, they can’t be too narrow for you to use the machine to its full capacity. So there needs to be a happy medium. Furthermore, some shredders have hand detection sensors that stop the blades if they sense that a hand is too close. Many machines also have jam-proof blades that can reverse the direction in order to expel anything that gets stuck. Whether you go for a unit that makes 50 decibels of noise or one that’s closer to 80 decibels, it’s always a good idea to keep them off to the side. However, home shredders present a trickier problem. After all, you might not have a choice as to where you’ll put it. You’ll definitely want to put the shredder on level ground. If the unit is standing at a slant, it may vibrate against the floor even more than it usually would. You can also place the unit on a thick anti-vibration mat or just keep it on a carpet. 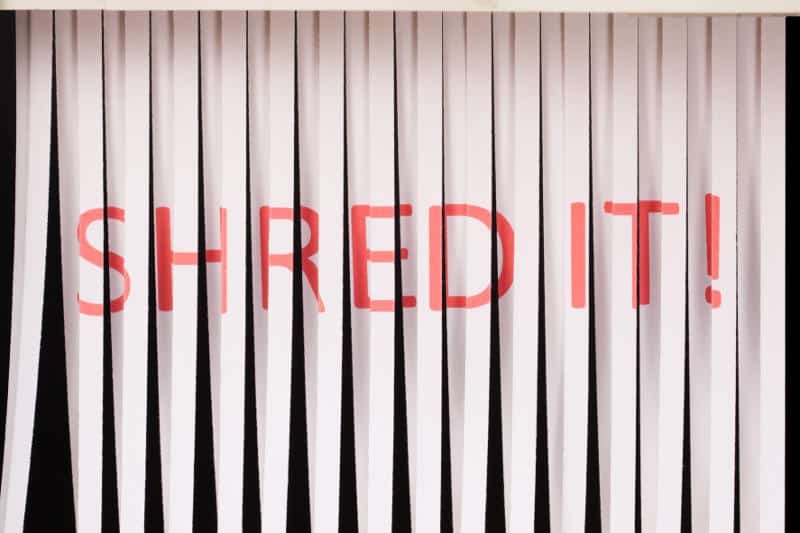 Furthermore, if you’re getting shredders for an office, you can always make sure that it’s out of the way, far from where your coworkers or employees work or rest. After all, if you have a large stack of paper to shred, even a low-level buzzing sound can get annoying, especially when the people in the vicinity are trying to focus on their work. And if you’d like more tips on how to keep a work environment quiet, you can check out my article on soundproofing office cubicles or my reviews of the best soundproof partitions. For today’s quiet product reviews, I thought we should switch it up a bit. I’ll be sharing and reviewing some of the most impressive units I’ve come across, as usual. But I’ll make sure to recommend other shredders from the same manufacturer as well. So let’s check out the first contender. The Bonsaii EverShred Pro3S16 shredder is a great cross-cut unit. As you now know, that’s going to ensure that your data is difficult to reassemble. In fact, this unit has a security rating of P4, so it makes particles that are about 0.15 by 1.37 inches. The machine can also handle a fairly thick stack of paper, up to 12 standard weight sheets. In addition, the shredder can also cut through credit cards, CDs — even clips and staples that got tossed in with the paper. Thanks to the machine’s jam protection system, you’ll be able to reverse the rotation of the blades in order to expel an item that can’t pass through. You can even do it easily and quickly by pressing the “up” arrow located on top of the device. What’s more, the power button is also right next to the arrow, with the “down” arrow to the right of it, if you need to get the blades to turn inwards. The brand logo is right underneath these simple controls, with two LED indicators under it. One of the indicators signifies that the waste bin is full to capacity, while the other protects against overheating. There are two insert slots on top of the machine. The longer one at the front is for paper, while the shorter one near the center is for plastic. These two slots lead to two different bins. The longer slot leads to a 4.2-gallon bucket that’s actually visible thanks to the transparent window running down the front of the device. This unit does have a 60-minute running time during which it will shred everything you throw in it. Better still, it will do so while only making 58 decibels of noise. However, if you need a more substantial unit, you can also get the Bonsaii 4S30 shredder. That machine looks and works exactly like the 3S16, except that it’s about 3 inches larger all around, at 16.1 inches wide, 24.4 inches tall and 12 inches deep. At that size, the shredder has a 7.9-gallon main waste bin and a 0.37-gallon plastic bin — which is the same as the 3S16. Unlike the smaller device, the larger unit can only handle 10 sheets at a time, although it can continuously work for 240 minutes. Still, if you don’t need this level of security, Bonsaii also makes some cheaper strip-cut shredders such as the S120-A model. However, I should say that I’m not completely sure how well this unit would perform in the noise department. This Fellowes shredder can give the previous unit a run for its money. In fact, according to users, Fellowes is one of the most reliable shredder brands on the market. So let’s see why that it. As far as I can tell, many of the same features the Bonsaii shredders have are also present here. The shredder is a cross-cut unit that has a security rating of P4, so the particles it makes are 0.15 by 1.5 inches big at most. However, this shredder only has a single insert slot on top for papers, CDs, cards and other miscellaneous paper attachments like staples. There’s also a flip guard for the slot that has a small slit that’s just thick enough to pass a CD through it. The insert slot takes up the majority of the top side of the device. Nevertheless, the features that really caught my eye were the LED indicators around the slot. Specifically, two of them really caught my eye. Above the slot, all the way to the right, you can see a SafeSense shield symbol. That feature is what’s going to stop the blades if your fingers get near the machine. There’s also an auto-reverse system if the machine thinks you’ve fed it something you shouldn’t have. Another LED indicator I liked was the capacity bar on the right, above the power button. That indicator actually tells you when the amount of paper you’re feeding the shredder is too much for it to handle. So how much paper is too much for this machine? Well, according to the manufacturer, this unit can take 16 sheets of regular paper at once. However, this unit will only work for about 20 minutes between 30-minute cool-off periods. I don’t actually think that you’d need more than 20 minutes of shredding time unless you’ve got a lot of documents to process. This 21.31 inches tall machine has a 6-gallon bin, so it has more space for the waste than the Bonsaii shredder. But if you don’t necessarily need all that space, Fellowes also makes smaller, equally as effective models. For example, their 62MC cross-cut shredder can handle pretty much anything this one does, but it’s cheaper and slightly smaller. At this point, I should note that these smaller devices have an even shorter running time and a longer recovery time. So keep the number of documents you usually need to shred in mind before buying one of these units. The Sentinel FM120P micro-cut shredder is the first of its kind on this list. Although it holds the same P4 security rating as some of the others I’ve mentioned, the paper particles end up being 0.15 by 0.39 inches. The unit is only 21.5 inches tall, 16.6 inches wide and 12.6 inches deep. However, unlike any of the others, this one has swivel wheels, which would make it easier to move around if you’re sharing it with other people. All of the controls are compressed into a single slider on top of the device, which can turn the blades on, reverse their direction, or turn the machine off. There are also two insert slots on top, one for paper and one for CDs, although they both seem to lead to the same waste bin. In fact, you’re supposed to feed credit cards into the main slot according to the illustration found on top of the unit. The reason for this is because the machine doesn’t bother to micro-cut the CDs — it cuts them into inch-wide strips. As you can see on the top side of the device, it’s only able to take 12 sheets at a time. All of the waste goes into a 5-gallon pull-out waste bin. You’ll even be able to see when it’s full thanks to a transparent window. With moderate use, you won’t have to empty the bin too frequently, as it can store 450 shredded pieces of paper. But Sentinel also makes smaller devices that would be perfect for home use. For example, the DM101P-BLE is another quiet micro-cut shredder that’s only 17 inches tall. The only thing that’s lacking about it is that it only has a running time of 2 minutes. Otherwise, I really like its specs — and there are also a few colors to choose from. While we’re on the subject of color choices, let’s transition into GoECOlife shredders. This micro-cut unit is fairly similar to the previous one in regard to the capabilities. However, it also claims to be energy-saving and carbon neutral. So where did I find the similarities? For one, this machine has a 4.2-gallon pull-out bin with a transparent window. It also operates similarly, as it has micro-cut blades that can handle up to 12 sheets of paper, as well as credit cards, and a separate shoot for CDs. Furthermore, the unit also has swivel wheels to make it easier to share with others. However, this device is really more appropriate for home use or for small offices since it’s only 19 inches tall. So if you really need a unit that can handle a greater capacity, GoECOlife also makes a similarly quiet-running 25 inches tall shredder that can take 20 sheets at a time. That shredder actually has close to 8 gallons of bin space — something worth considering if you’re a heavy user. The SimplyShred unit I’ve chosen to close this list with also has close to 8 gallons of space. In fact, the 7.4-gallon pull-out bin would be ideal for bigger businesses. The shredder only has a few controls — ready, reverse, and the off switch. But really, what else would you need? The cross-cut blades bring the security rating of this device to level P3, which is pretty good if you’re not dealing with a puzzle master. The blades can easily handle up to 18 sheets of paper at a time and any staples that get in their way. There are also two slots at the top of the unit. One is for paper and the other for CDs and cards, though both seem to lead to the same bin. If you don’t need such a powerful machine, you can just get the FOC508M model from the same company. Both machines have the same security rating. However, the smaller one (which is only 14.6 inches tall) obviously has a smaller capacity. You can only feed it up to 8 sheets at a time, and you’d need to be careful not to feed it staples. The world of paper disposal machines sure has changed since the days of ye olde chainsaw shredders. If you’d rather not work around something that sounds like someone is cutting down an oak tree inside your office, any one of the machines I’ve mentioned will do. And if you’d rather keep looking, I hope these reviews have shown you what you should focus on. While we’re on the subject, there are other changes you can implement to reduce the noise in your office. For one, you can read the articles I linked to about soundproofing offices. You can also purchase a silent keyboard if the one you’re using is too old and banged up. Alternately, if you have to listen to the incessant ticking of a clock while you work, you can also get one of the silent wall clocks I reviewed. The same goes for other appliances and accessories. Just check out my reviews to see if I have any recommendations for you.